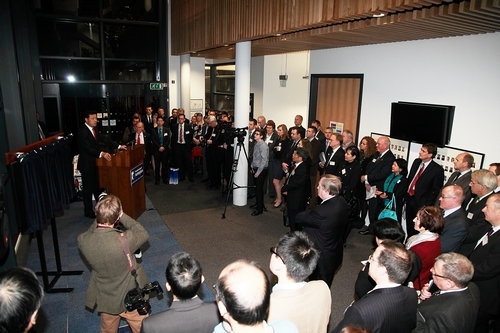 It is a real pleasure for me to once again visit your Nottingham University and unveil the Si Yuan Centre. 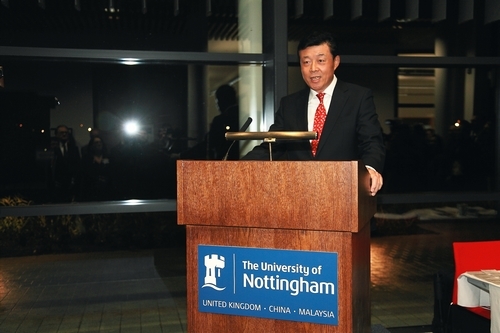 The Si Yuan Centre is an excellent symbol of how Nottingham University continues to deepen its links with China. I am much impressed by the multi functional aspects of this new Si Yuan building. I admire its design as a ‘trinity’ building housing under one roof the School of Contemporary Chinese Studies, the China Policy Institute and the Confucius Institute. I also like the full name of the building – The Si Yuan Centre – The New China Building. I believe this inspiring name has three implications. First, we need to Si Yuan when we study China. I believe when studying China, we also need to think about its source. Traditional culture is the root of the Chinese nation. Chinese language is the foundation of the Chinese culture. I am glad to learn that more than 1,000 undergraduates here in Nottingham University have signed up for Chinese language course. This is the highest number among all universities outside China. Second, this is a base for study of new China, as its name suggests. Undoubtedly the School of Contemporary Chinese Studies is not a conventional school of Chinese studies. It is a school of neo-sinology that breaks from stereotypes. Again I am glad to learn that its specialty researches are all frontier areas in today’s China, such as China’s financial market, corporate finance and commercial economics. The Si Yuan Centre has attracted a very strong contingent of teaching faculties and scholars from around the world. All of them are leading experts in contemporary Chinese studies. So it is natural that the School of Contemporary Chinese Studies and China Policy Institute here have become champions of neo-sinology. Certainly this has made them leaders in Britain and even the world. I congratulate you on your achievements. The third reason why the Si Yuan name inspires is that this is a new building. The Si Yuan Centre also inspires with its design featuring openness and innovation. It is a collaboration of Chinese and Western cultures. It also impresses with its design for energy efficiency. So, I urge students and scholars here to carry on the spirit of innovation and openness in your future analysis and study of China. I hope you will see development and progress of modern China from a comprehensive, objective and reasonable perspective. If you do so, you will realise harmony between this building and its tenants and do justice to its name – the new China building. These magnificent facilities give you a great platform to advance your ambitions with the study of China. This means Nottingham University can play an even bigger role in promoting understating between UK and China and between China and the World. In conclusion, I wish the School of Contemporary Chinese Studies, China Policy Institute and Confucius Institute of Nottingham University ever greater success. I also hope the Si Yuan Centre will become not only a new land mark of Nottingham University but also a standard-bearer of Britain and even the entire world in contemporary Chinese studies.